Adrenal Fatigue is a collection of signs and symptoms that results from low function of the adrenal glands. The paramount symptom is fatigue that is not relieved by sleep. The syndrome may be caused by intense or prolonged stress, or after acute or chronic infections, especially respiratory infections such as influenza, bronchitis or pneumonia…. People suffering from Adrenal Fatigue often have to use coffee, colas and other stimulants to get going in the morning and to prop themselves up during the day. 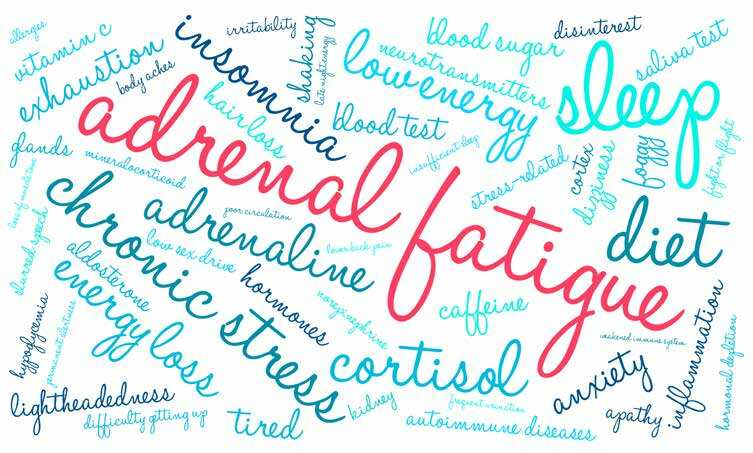 Adrenal fatigue is the net result of years of continuous high cortisol output by the adrenals caused by chronic stress from job, family, illness, injury, and poor diet and lifestyle associated with hightech modern living. After years of chronic stress, the two small triangular supra-renal glands poop out, and we become another casualty of adrenal fatigue, the 21st century epidemic. Since mainstream doctors can’t seem to help, either ignoring the syndrome, or prescribing anti-depressants for it the condition goes untreated. Cortisol is the stress hormone, and is produced in response to stress. Cortisol is important for blood sugar regulation, it mobilizes glycogen in the liver to maintain blood glucose levels. Symptoms of hypoglycemia are common in low cortisol adrenal fatigue. Also low blood pressure or inability to maintain blood pressure upon standing is also a common symptom. Another physical exam finding is an unstable pupil response to light. The pupil at first contracts and then after a few seconds opens and closes. Although cortisol can be measured in a blood sample, the best way to measure corticol levels is with 4 saliva samples taken throughout the day. There are literally hundreds of medical research studies validating the usefulness of salivary cortisol measurements. Take steps to reduce stress with gentle exercise,meditation, and yoga.